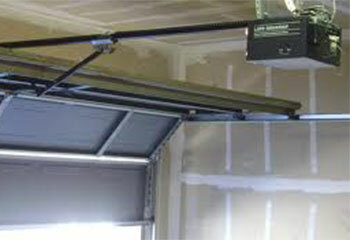 Our technicians are highly skilled at performing a wide range of garage door repair and replacement services. You can find a few examples of our latest work by checking out the recent projects below. Customer Issue: The belt drive opener started catching itself partway down its track, making opening the door impossible. Our Solution: A replacement track for the trolley needed to be installed, as the old one had rusted and deformed to the point where the trolley couldn’t roll along it. Our team gave the trolley rollers some extensive cleaning and maintenance as well before returning the garage door to its tracks and testing the system. Our Solution: Safety is incredibly important when dealing with these components, so we made sure to carefully remove the broken unit before setting up the new spring. We then adjusted its tension to ensure the door remained balanced. 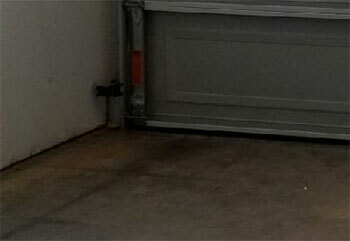 Customer Issue: Dented door panels. 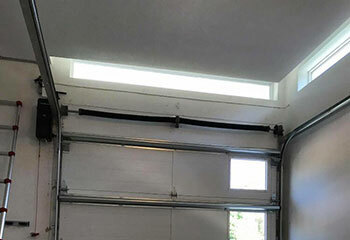 Our Solution: The major benefit of a sectional garage door is that when it gets damaged, only the panels that were affected need to be replaced. Provided that the door isn't too old, finding new sections from the same manufacturer should be simple enough. This was the case with this customer, and we were able to acquire new panels from the door's original manufacturer and replace the old damaged sections with them. 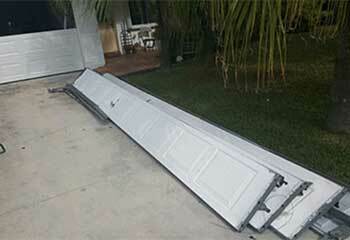 Customer Issue: A reversing garage door. Our Solution: The reason for the problem were the opener's photo eyes, which had become misaligned and made the door go back up when the customer tried closing it. We readjusted them back into their correct position, and tested the door afterwards. It was finally able to close without any issues.